The eDiscovery Nerd | All Things eDiscovery And Litigation Support With Some Analytics And Forensics Mixed In. These Thoughts And Opinions Are Strictly My Own. We added to the TAR Course again this weekend with a video introducing Class Fourteen on Step Seven, ZEN Quality Assurance Tests. ZEN stands for Zero Error Numerics with the double-entendre on purpose, but this video does not go into the math, concentration or reviewer focus. 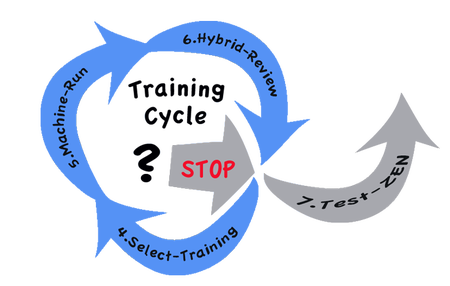 Ralph’s video instead provides an introduction to the main purpose of Step Seven from a work-flow perspective, to test and validate the decision to stop the Training Cycle steps, 4-5-6. TAR eDiscovery orders and opinions have made some pretty big splashes in the last five years, and the recent FCA US LLC v. Cummings, Inc., order, despite being brief, was no exception. The court took up the question of whether keyword search culling of a data set prior to the application of Technology Assisted Review (i.e., TAR or Predictive Coding) is the preferred method. The answer, in the court’s opinion, was simple but powerful: it is not. Some have described this decision as a “nightmare.” Others have less vividly decried it as likely to impede much needed progress in the use of advanced analytics. While I understand the causes for concern, I find it hard to disagree with the court’s decision based on my understanding of the relevant judicial precedent and the gravity of the flaws associated with keyword search culling. Personally, I don’t believe that TAR judicial history to date, apart from the circumstance and proportionality based rulings in In re Biomet (Apr. 18, 2013) and Bridgestone (July 22, 2014), support another outcome…. This post is Part 2 of a series – you can also watch a video of the related webinar, or read Part 1, on the kCura Blog. In our last post, we discussed the value of looking at analytics in e-Discovery with a creative mindset, and a few steps that you can take to expand your problem solving horizons. As we noted there, analytics is most commonly thought of as a tool to be applied during the review phase of the EDRM to control data sizes; however, we’d like to change that. At Altep, we frequently use analytics to solve many more problems than just those found in the production review arena. With a firm grasp on the technology, plenty of curiosity, and a healthy passion for “building a better mouse trap,” we have found quite a few areas where analytics can help turn the eDiscovery rat race into a more methodical and scalable process. The presentation phase of the EDRM is one such an area. While the EDRM roadmap tells us that analysis occurs in conjunction with review and production, much of the real analysis work is done post-production, in the time leading up to presentation. Cases are often made or broken at deposition, and most certainly at trial. Thorough preparation and a crystal clear understanding of the facts and available evidence are essential to success. However, you may encounter any of several potential pitfalls as you meet your discovery deadline and begin preparations.